CUSU Council voted unanimously to reaffirm its support for divestment this evening, with CUSU president Daisy Eyre and other sabbatical officers now mandated to work closely with Cambridge Zero Carbon Society in support of the campaign. Council had previously voted to support the divestment campaign in Michaelmas 2015, though the motion voted on then was more general in its terms. The motion voted on this evening was more precise in its resolutions, calling on CUSU to make a written submission to the University working group currently meeting to discuss the advantages and disadvantages of divestment from fossil fuel companies, and for CUSU to make a public statement in support. It also mandated CUSU sabbatical officers to lobby on behalf of the divestment cause in meetings with University officials, particularly the vice-chancellor Stephen Toope, and for an extra £100 from the CUSU Council Free Budget to be allocated to the Zero Carbon campaign. Speaking in proposal of the motion, Christ’s student Hattie Hammans said that the divestment campaign urgently needed CUSU support as the working group “aren’t sticking around forever”. She also argued that divestment had broad student support, with Cambridge Zero Carbon Society candidate Fieke van der Spek receiving the most votes for Ethical Affairs officer in the recent elections to the CUSU part-time executive. As the motion was opened for discussion, Eyre said that she was “basically totally in support”, but wanted to note that CUSU have already made a submission to the working group, and Eyre had made a public statement of support at the second town hall meeting about divestment. Questions were also raised as to why an extra £100 was required by Cambridge Zero Carbon Society, to which Angus Satow, who seconded the motion, replied that it was largely to cover printing costs. Clare JCR vice-president Jake Gilbey said that they had discussed the motion in college, and while most students had said they were in support, one JCR member wished to make it clear that being against divestment did not mean being against the idea of tackling climate change. Satow replied that the campaign “did not vilify anyone”, but noted that “shareholder engagement has failed for 30 years”, referencing the argument that the best way of tackling climate change is by staying on the boards of fossil fuel companies and trying to effect change from within. Council voted unanimously to both adopt the short-term ‘actions’ proposed in the motion, and for CUSU to adopt a longer-term policy of supporting the divestment campaign. 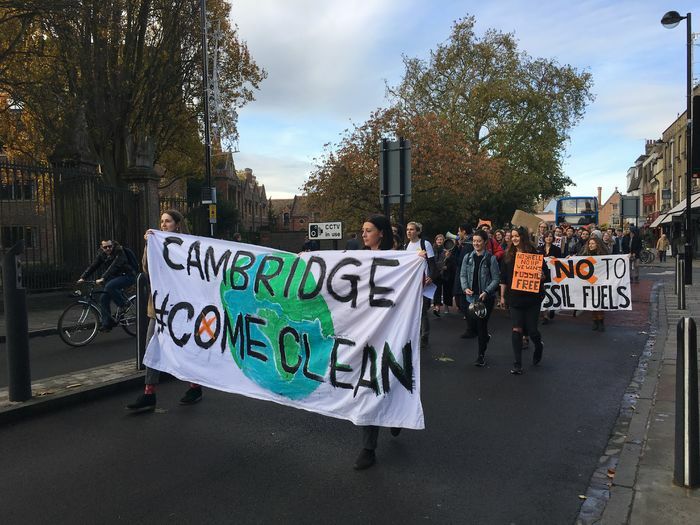 Angus Satow, press officer for Cambridge Zero Carbon Society, told Varsity: “This is yet another big step forward for our campaign. As this motion shows, students are united in demanding that the University fully divests from fossil fuels. Academics, too, have voted for divestment at Regent House.